Beauty Find: mark Flip For It Spring Color Kit: L.A.
We were lucky enough to get a sneak peak a few weeks ago at the latest collection of Flip For It palettes from mark cosmetics. We were really excited and pleased with the concept and the shades in the Los Angeles version in particular. The Flip for It Palette features seven products 4 lip shades, 2 eye shadows and 1 cheek shade. It measures about 3.5"in x 3.5"in and includes a mirror and a snap shut front closure with hard case. The colors are really pretty and versatile. My favorites were the two eye shades -- Hollywood, a shimmery taupe and Mulholland, a pretty deep golden-brown shade with light gold shimmer. I loved using Mulholland as a eyeliner as well. The cheek shade is a soft pink/coral, perfect for spring and really brightened up my complexion. This blush will work best up to a Michelle Obamba shade. To get to the second palette, I just had to flip the tray around. The two lip colors Melrose and Rodeo Flip were "your lips but better shades". Melrose is a true sheer cinnamon and Rodeo is a deeper sheer brick red. These will work on all skin tones, but note that they are for a sheer, glossy look (so if you lips are more pigmented a light trace of lip liner will help to define the color). Editor's Note: This is such a great concept for a palette, but we would love to see an applicator included for true ease of use and to make it the perfect little item for travel. 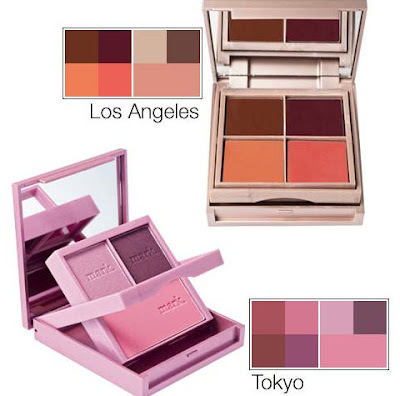 For those of you who are more interested in a combination of vibrant and pastel pinks and purples, try the Tokyo Kit! Go-->mark Flip For It Spring Color Kit - L.A.